A well-decorated audience listened as Don Graves, a 93-year-old, World War II veteran, talked of his time fighting on Iwo Jima. 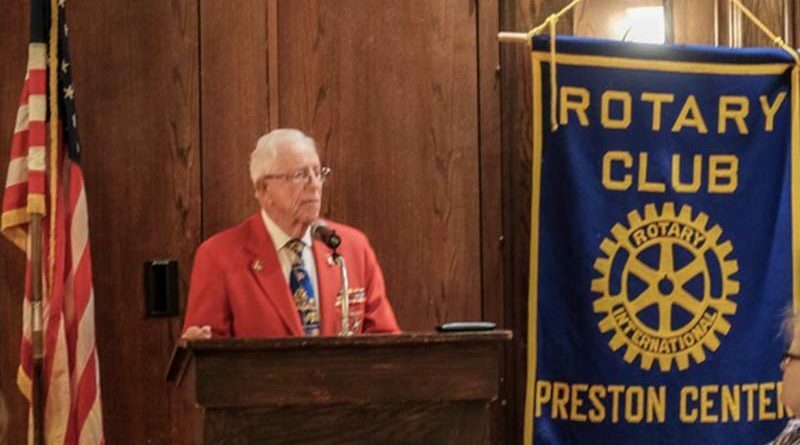 Veterans from such wars and conflicts as Vietnam, Korea, the Persian Gulf, and Afghanistan packed the banquet hall at Maggiano’s at NorthPark Center for the November event held by the Preston Center Rotary. Graves, who was born in Michigan, signed up to be a Marine when he was 17 after being moved by the president’s words in response to the Japanese bombing of Pearl Harbor. To this day, Graves still has Franklin D. Roosevelt’s speech memorized. Graves brought his work ethic with him to the military; as a 14-year-old, he worked weekends and three nights a week at a JCPenny store, giving more than half of what he made to his mother. When he was old enough to join the Marines, his mother refused to sign the permission papers until his father convinced her. As a flamethrower, Graves was in charge of “smoking out” enemy soldiers in tunnels along the island. It was, as he put it, a terrifying ordeal, but necessary to claim control of the pivotal island in the Pacific theater. “We needed to be able to land our planes and use the runways [on Iwo Jima],” he said. In March, Graves returned to Iwo Jima as part of a program sponsored by Daughters of World War 2 Vets and brought home a vial of black sand.